If you frequent Twitter or Facebook, chances are the catchy name of a new website — Ello — flitted across your screen recently. The social media website toggled from stealth mode to widespread sensation over the course of just a few days this week: For a time yesterday, the currently invite-only website shut down the ability for existing users to send out invitation codes. The explanation: "Ello has gone viral." If you're still scratching your head about what the hell-o is Ello, don't worry; we've got you covered. 1. This is social media with a manifesto. The site's motto is "Beautiful, Simple and Ad-Free" — and Ello, at first glance, delivers on the promise. The site is clean and spare, with plenty of white space — think a sort of Facebook/Tumblr hybrid, redesigned by (and populated with, if the user profile photos are any hint) hipsters. You can post messages, add photos, reply "@" ("at") your fellow-Ello-ers and invite friends to join — fueling the site's exponential growth. Given the site's explosion in popularity and hype in recent days, the message is striking a deep chord. 2. Yes, you heard right: Ello is based in Vermont. Cofounder Paul Budnitz, who teamed up with Colorado-based design firm Berger & Föhr and hacker collective Mode Set, lives in Shelburne, and splits his time between New York and the Green Mountain State. Budnitz is one of seven cofounders, who collectively own a majority share in the company. According to U.S. Securities and Exchange Commission filings, Ello shares the same address — 47 Maple Street, the home of the Karma Bird House and a number of start-up companies — as Budnitz's high-end bicycle company, Budnitz Bicycles. 3. Cofounder Budnitz is a serial entrepreneur — and a successful one at that. As Sarah Tuff wrote last year for Seven Days, Budnitz is no stranger to good design. Before Budnitz Bicycles (the self-proclaimed maker of the "lightest, fastest, and most elegant city bikes in the world"), he started KidRobot, a creator of art toys, fashion apparel and accessories. Several of KidRobot's creations are in the permanent collection at the Museum of Modern Art in New York City. 4. Vermont venture capital funding played a big part in launching the site. And that's provoking some consternation in the peanut gallery. Shelburne-based FreshTracks Capital invested $435,000 in seed funding in Ello in January. When that news broke yesterday in a post on the new website itself, critics immediately alleged Ello had made a pact with the devil. How could the site, they wondered, maintain its ad-free promises with a venture capital firm looking for a return on its investment? According to a story at Gigaom.com, a site devoted to news about emerging technologies, FreshTracks partner Cairn Cross met Budnitz about a year ago in Vermont. "Budnitz pitched FreshTracks on his ad-free social network concept, monetized with a freemium plan where users would pay for added features, and Cross was intrigued," according to the tech site. According to Gigaom, Cross wasn't concerned about allegations that big VC would push Ello to the dark side. “We practice venture capital in a way that very few people practice it. We’re really small-town venture. We’re patient, we have long exit horizons, we’ve had some successes, we’ve been around for awhile,” Cross told the website. FreshTracks partners declined to speak with Seven Days for this story, instead directing us to Budnitz himself, who was unavailable for an interview today. 5. The site's timing is great. Part of the buzz surrounding Ello has to do with the most recent backlash against Facebook, this one having to do with the so-called "real name" policy. Facebook insists that users set up profiles under their legal names — the one that appears on a passport or credit card. The site is cracking down on users who don't comply. It's riled members who use pseudonyms on the site for a variety of reasons; think drag performers, queer or trans individuals, musicians, roller derby competitors or professionals who want to keep their professional and private lives separate. Ello doesn't have the same requirement. 6. In particular, the site is said to appeal to gay and lesbian users "fleeing" Facebook. 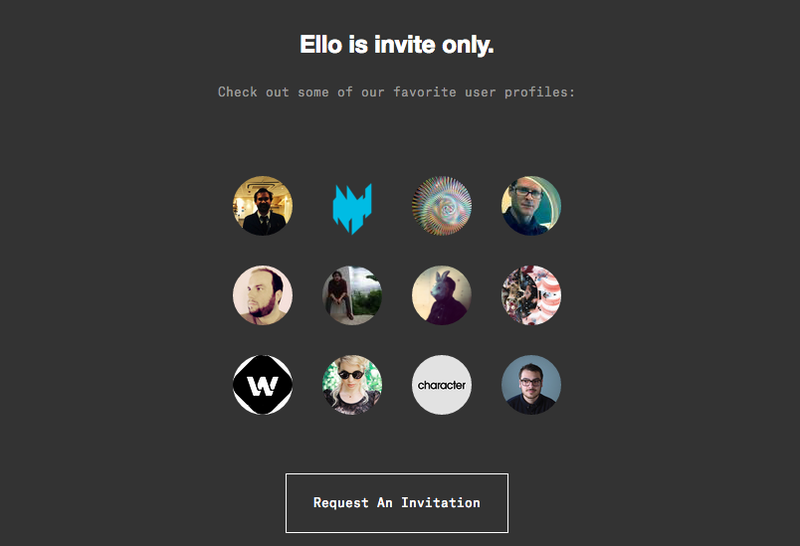 "Is Ello the Anti-Facebook ... We've All Been Waiting For?" asked the site queerty.com in one headline. Over on the Daily Dot, a similar headline reads: "The Great Gay Facebook Exodus Begins." When Daily Dot writer Taylor Hatmaker asked Budnitz about the so-called exodus, Budnitz confirmed that Ello has seen an uptick in interest from LGBTQ users. "Yes, we’ve been hearing about the Facebook drama too over the last few days," Budnitz said. "Ello welcomes the LGBTQ community and we’re very excited to see so many people moving over! " After a group of Radical Faeries signed up a couple of days ago, Budnitz has been watching an uptick in queer users joining Ello—"which makes us very happy," he notes. "There does seem to be a bit of an avalanche since then." 7. That said, not everyone is convinced that Ello is a be-all, end-all solution to the perennial hand-wringing over Facebook. There are plenty of doubts already brewing about Ello — including the aforementioned uneasiness around the site's funding. The site's in beta mode, which means while Ello is promising more features as the site expands, there's still limited functionality right now. As Tech Crunch reported yesterday, the site lacks privacy controls, or the ability to block abusive users. And users and pundits alike say it's too soon to know if Ello can last. Ello isn't the first upstart to take on Facebook: "We’ve seen Facebook alternatives, like Diaspora, come and go. Or ones like Google+ come then fall flat," wrote Tech Crunch. "Ello might be onto something more organic. Diaspora was certainly too geeky and probably way too early. Perhaps it’s Ello’s time?"